"In September 1901, while working in the kitchen, Gemma frequently paused out of her great love for Jesus to contemplate the large Crucifix that hung on the kitchen wall of the Giannini home. “The more she looked at it” - says Venerable Father Germano in his biography of St Gemma – “the more her heart beat in her breast". She strongly desired to come to Him and unite with Him, and many a time she attempted to. At last she cried: - ’Let me come to You, for I am thirsting for You!’. - Mar­vellous to say, as it already happened to St. Fran­cis of Assisi and our holy Father, St. Paul of the Cross, the Corpus on the Cross became alive, and Jesus appeared to her and with His right hand detached from the Cross, with a loving look He beckoned his faithful Bride to come to Him. Immediately, Gemma rushed to Him and reached Him, and while miraculously held aloft in the air, Jesus embraces her and lays her lips on the wound in His Holy Side; Gemma, keeping tight to Him with both arms, drank plentifully out of that divine spring, while remaining with her body as if she rested upon a cloud”. 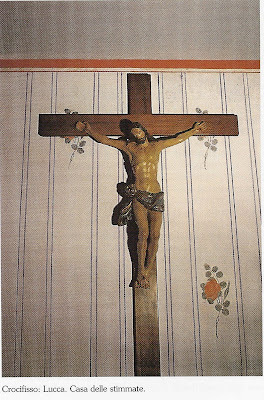 (Note: The Photograph above is the actual Crucifix that came alive during the miraculous vision related above. 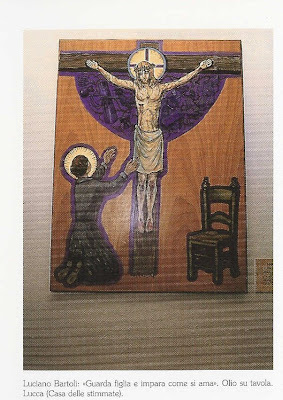 It is currently on display along with other articles pertaining to the life of St Gemma at the "Casa Della Stimmate" or "House of the Stigmata" in Lucca, Italy. -Editor). On another occasion Jesus appeared to Gemma with the Cross on His shoulders and said: "Gemma, will you take my Cross? See, this is the present I have prepared for you." And she replied, "My Jesus, yes, give it me, but give me also the strength to carry it, because my shoulders are weak; at least that I may not fall under it." And Jesus again: "Would it sadden you if I were to give you to drink of My chalice, even to the last drop?" And Gemma replied: "Jesus, may Your most Holy Will be done." 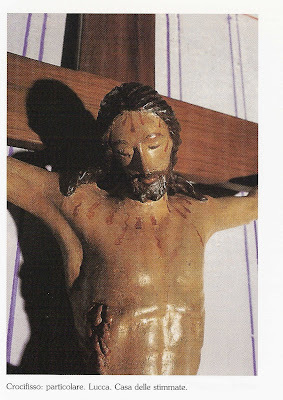 (Photograph on the left is a closeup of the actual Crucifix that came alive during the miraculous vision related at the top of this article) . On another occasion, He appeared to Gemma nailed to the Cross, all covered with wounds and bleeding. "At that sight," she said to me [Father Germanus], "I felt such a great sorrow, thinking of the infinite love of Jesus for us, and of the sufferings that He had endured for our salvation, I then fainted and fell. After the lapse of an hour or so I came to myself, and then there arose in my heart such an immense desire to suffer something for Him who had suffered so much for me." From that day forward Gemma did not seem herself. The sight of Jesus suffering and the thought of the mission entrusted to her by God had, as it were, transformed her into another creature. The thirst to suffer tor­ments of every kind seemed to consume and rend her whole being. To satisfy her, torrents of fire would be needed. Listen to her exclamation: "To suffer, but without any consolation, without any comfort; to suffer for love alone." Her sufferings were but trials in which grace advanced step by step, preparing her for the grand immolation that was to be accomplished on the Calvary of Jesus-her deathbed. Hence she added: "I am very happy. Jesus does not cease to love me; I mean that He does not cease to afflict me more than usual." It was indeed Our Lord Himself who had taught her this sublime doctrine. "On Saturday evening," she writes to me, "I went to make a visit to the most holy crucifix. There came upon me an ardent longing for suffering, and with all my heart I implored of Jesus to satisfy me. And, since that evening, He has granted me a cease­less pain in my head, but such a violent pain! And I am almost always crying through fear of not being able to bear it." We can see by these words that she feels that she may not be able to hold out, and yet she does not desist, but continues to pray that her great longing to suffer more and more may be gratified. Nay, she declares that in suffering she finds all her delight. "Yes," she says, "I am happy in every way that Jesus wills, and if Jesus wants the sacrifice of my life, I give it to Him at once. If He wants anything else I am ready. One thing alone is enough for me, to be His victim, in order to atone for my own innumerable sins, and, if possible, for those of the whole world." From Thursday evening to Friday afternoon each week, as we know, this heroic child went over all Calvary in body and soul, suffering unspeakable agony in company with Jesus Crucified. Whoever could have passed but once through such torments would shudder at the thought of them. Gemma, who again and again passed over that way of sorrow and pain, longed for the day, counted the hours she had to wait until it came, and, in the words of those who were around her, "prepared to suffer as if she were preparing for a banquet." (Picture on the left is a image of Gemma embracing Jesus as occured in several of her visions) Our Lord took infinite delight in such great generosity and heroism, and by open proofs of tenderness, showed His great joy and happiness at having chosen a spouse so entirely according to His Heart. Thus, on one of many occasions, making His presence felt in her soul, He asked her if she had suffered much in a long trial that she was still undergoing. Gemma's answer: "With Thee, oh Jesus, one suffers so well! What is it to suffer thus for many days, if afterwards You come quickly and console?" And Jesus replied: "Know that when you were suffering, I was always at your side. I beheld your distress and I was gratified by it." "But, oh Jesus, why for so little, do you give me a reward so great?" Then embold­ened by her filial confidence she approached her Saviour, and kneeling with her heart all on fire, she kissed one by one those precious Wounds. But when she came to the Wound in His Side she could hold out no longer, and fell in a swoon at the Feet of her Jesus." "Jesus stood up and proclaimed, "If any one thirst, let him come to me and drink. He who believes in me, as the scripture has said, 'Out of his heart shall flow rivers of living water'." St. Gemma continues to amaze me....such a great love for the Crucified Lord!! I've never seen anything like it! Thank you for posting this article, it was really beautiful! Thank you for your kind comments. I am glad to hear that you enjoyed the article. Sorry to ask this stupid question, but I thought St.Gemma spent all her life in the convent ? on your site, it said that she had an adopted family the Gianninis, and upon her death bed, in one of the picture posted up here, she was surrounded by the adopted family . That take me to another question, where is her own biological family all this time ? How come they were not with her throughout her last days ? St Gemma lived and died a lay-person. 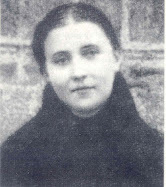 For about 4 years, St Gemma repeatedly tried to enter several different convents, in particular the Passionists, but eventually she realised it was not God's will, so towards the end of her life she heroically accepted the fact that it was not God's will for her to become a nun, and she suffered greatly because of this, but eventually she resigned herself to it and from that point on she never asked about entering a convent again for the remainder of her life. In regards to her biological family, her mother died when she was 8 years old, and her father died when she was 19. Her brother and two of her sisters had also died. Her reminaing brother had moved to Spain and her sister Angelina was very poor, just like Gemma, so this is why the Giannini family took her in not long after she was orphaned by the death of her Father. Prior to this two of her autns did take her in for a little while, but Gemma was very sick at the time (she was later miraculously cured) and they could not care for her and besides Gemma did not want to stay with them because she found it difficult to practise her Catholic faith while staying with them, as they were quite "worldly" and not very fervent in practising their faith. 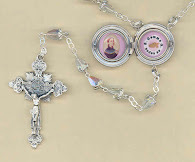 Thank you very much for posting this beautiful article and pictures regarding "St. Gemma & the miracle of the Crucifix!" What a moving and beautiful account of our beloved St. Gemma and her love for the Passion of Our Blessed Saviour! Thank you for everything you post on our dear St. Gemma! Thank you also for your blessing -I sincerely appreciate it! st. gemma is indeed deserving of Jesus'miracle of the crucifix. i use this page to pray. looking at the cross reminds me of how much the Lord loved st. gemma. i ask the Lord to spare me His love by reminding me of how much He loves us. thank you glenn. may God bless you in every way. I am really happy to hear that you enjoyed this article. St Gemma's devotion to Jesus crucified is really an inspiration and example for us all. 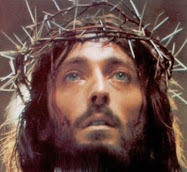 The saints, I believe, show us that when we contemplate the passion of Jesus, we appreciate more His infinite love for us. 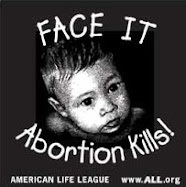 May God be with you and draw you ever closer to Himself. Lord God Bless you. Please read Matthew 10:8. Blessed be the Holy Crucifix. Thnks very much for ur great article.. I will now kiss the Crucifix more passionately. I thank the Lord for bringing me to Iraq for me to come across the most appealing saint ever. I was so blessed to read all her articles and it had a bearing to my own experiences for which I seldom mention. In my homeland of Fiji Islands, church members thought I have gone mad, but reading about St Gemma, it gave me the confidence that the Lord has something for me, and now I have been asking St Gemma to help me to understand what the Lord has for me. I have written some notes of what happens to me. The Lord uses my body to touch people or even pearce pain to both my hands. Can someone from out there visit in Fiji to get an account of what I have been through. My email address is eroniv@hotmail.com.